Standing out from the crowd in a sea of social media, blogs, advertisements and campaigns can be nearly impossible. If your business doesn’t want to post “just another post” that gets scrolled past, then focus on creating graphics that catch your target audience’s eye. Posting quality content not only catches their attention, it improves the customer experience. Graphic design is an important marketing tool that enhances how your brand communicates with its audiences and visually identifies what sets the brand apart from the competition and clutter of the internet. Not many years ago, creating an eye-catching graphic meant dealing with a hard-to-learn design program and browsing through the same old stock photos that everyone else is also using. It was a slow and tedious process and quality results were best achieved by hiring a creative director and a top-notch graphic artist. With new technology, free programs and a dash of creativity, we can now produce designs that tell a story and convey ideas in a way that is not only effective but also attractive. Why are graphics important for your marketing strategy? 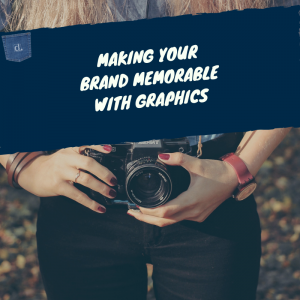 And, how does Denim Marketing use graphics to make your brand memorable? You’re about to find out! Social Media Examiner found that 32 percent of markets say visual images are the most important form of content for their business, with blogging in second at 27 percent. John Medina, a developmental molecular biologist and author of Brain Rules stated that when people hear information, they’re likely to remember only 10 percent of that information three days later. However, if a relevant image is paired with that same information, people retained 65 percent of the information three days later. 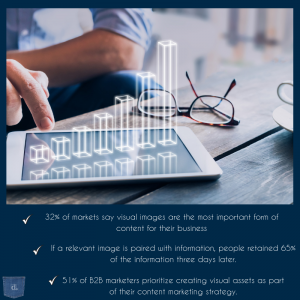 The Content Marketing Institute found that 51 percent of B2B marketers prioritize creating visual assets as part of their content marketing strategy. The statistics for graphics and visualization on social media are even more eye-opening with research showing that tweets with images receive 150 percent more retweets than tweets without images and Facebook posts with images see 2.3 times more engagement than those without images. On Snapchat, users share 9,000 photos per second and watch 10 billion videos per day. The users alone for Instagram and Snapchat are proof that images attract and sell. Currently, there are over 500 million active Instagram users and 187 million daily active Snapchat users. In addition to catchy headlines and relevant content, images are now a main source to lure readers to your blog. A picture is the best way to create a positive first impression and evoke emotion about the content contained in that recent post. Adding a quality image or graphic helps the reader to know what the story is about — thus, improving the customer expeience. Using images in blog posts also helps create structure; it’s easier to divide the text into some logical parts and make the content more enjoyable and readable. With more organization, appropriate images and sound search engine optimization practices, blog posts perform better in search engines. The highest rankings are given to long posts with images, plus you can add titles, alt tags, and descriptions to images in your content management system providing keywords for a more optimized search. Professional graphic design work is notoriously undervalued today in businesses. When financial times get tough and companies run on limited resources, their creative budget is one of the first things cut. Even with tight budgets, it’s still vital to have a beautiful website, attractive graphics and an eye-catching social media presence. So whether you are hiring a top-ranked graphics firm like Creative Thunder or doing it on your own, just do it! 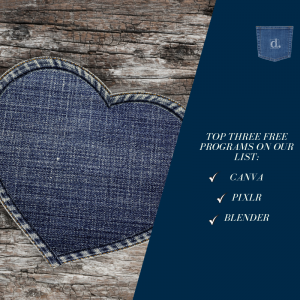 Our team has researched the best free programs available, and while these are not the only free options around, they are on the top of our list! Canva – Canva is simple to use and offers a variety of useful tools. Denim Marketing uses this site to design all things digital. It has a free version and a paid version. You can design graphics, drag and drop text, edit photos and choose from several ready-made images that all provide tons of easy ways to communicate visually on social media and your blog. There is an option for almost every design element and font (for free!) to help create Facebook cover photos, branded images, customized blog images, email pieces, flyers and more. Pixlr – Free graphic design software Pixlr claims to be the most popular online photo editor in the world. It contains more than 600 effects, overlays and borders, and lets you do all the main things you’d expect from a photo editor, from cropping and resizing to removing red-eye and whitening teeth. Blender – For companies that don’t have a budget for professional 3D software, Blender is a great solution! It is a free, open source 3D content creation suite that is available for all major operating systems and is constantly being updated. Users can do almost anything 3D related with this software including, modeling, texturing, animation, rendering and compositing. Our dream team at Denim Marketing strongly believes that design is a major game changer in content marketing. After all, content isn’t just written words. Content includes photos, images, graphics, videos, audio, etc. When creating blogs, advertisements and social media content, we work to deliver professional, fun and creative imagery for our clients. We have included examples of some of our graphics in the photo gallery with this post. As you can see, we use a variety of design templates to tell our client’s stories. 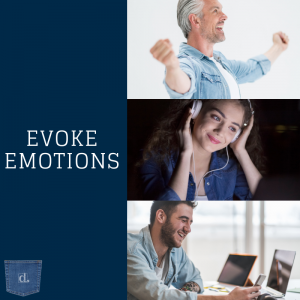 We have seen large increases in social media engagement and clicks back to our client’s websites since starting to build more creative graphics. For many of Denim’s clients, social media is one of the top sources to that sends quality traffic to their website! If you’re struggling with how your marketing strategy improves the customer experience, we’d like to help. We will work with you to create a marketing strategy that incorporates content including social media, blogging, public relations, email marketing and graphic design for your business. 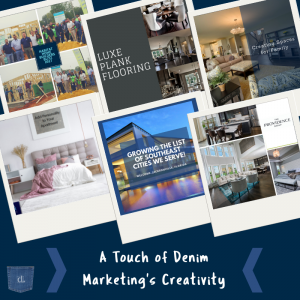 Call Denim Marketing at 770-383-3360 or Contact Us via this website to let us help you create appealing and relevant images for your company.